If you are looking for the best quality knives, you cannot go wrong with Chicago Cutlery. 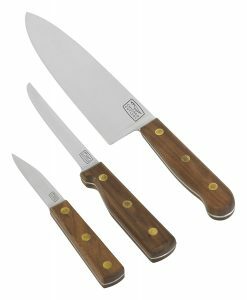 The Chicago Cutlery Walnut Tradition set offers high-carbon stainless steel blades which will resist rust and stains, as well as attractive and durable wooden handles. The blades are made with Taper Grind® technology, so they are easy to resharpen and stay sharp for a long time. The brass rivets which attach the blade to the handle are triple-compressed to offer stability and safety, and the full metal tang gives extra control, strength, and balance to each knife in the set. Although Chicago Cutlery also offers knives with soft-grip, polymer or stainless steel handles, wooden handles offer a timeless elegance, and this knife set will look beautiful displayed on your kitchen countertop. Some people prefer the look of metal or polymer, but wood will always be the classic choice. Not only does it look stylish but it will last for many years. If you are interested in these knives, you can choose from the Chicago Cutlery 4-piece Walnut Tradition, a 14-piece block set, or individual knives such as the Chicago Cutlery Walnut bread knife or some of the smaller knives. 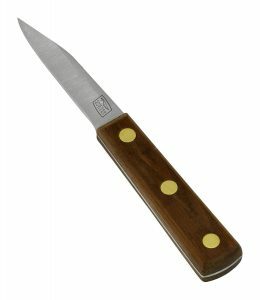 You can also begin with a small collection and then add to it until you have completed your professional-quality Chicago Cutlery Walnut knife collection. Consider knives as an investment rather than a luxury, because they are something you will be using every day. These knives are designed and constructed beautifully, and you can be sure they will last you for many years. Of course, with knives, you not only have to make a wise choice when choosing them in the first place, but you should also maintain them properly. Some people throw their knives in the dishwasher, but it is best to wash them briefly in warm soapy water, then wipe them immediately on a clean towel. This will clean them properly and eliminate any water marks. Sharpen your knives when they need it, to keep them sharp enough to effortlessly cut through your food. If you are happy to maintain your knives properly, then you deserve to invest in a great set, choosing a superior metal for the blade as well as a beautiful handle such as walnut. Whether you want to extend your collection of knives or replace your existing set with a new one, these knives are truly wonderful to use and will slide effortlessly through your ingredients and be a real pleasure to use. See what reviewers have to say about Chicago cutlery, and you will discover why so many home cooks love them. Have You Ever Used Chicago Cutlery? 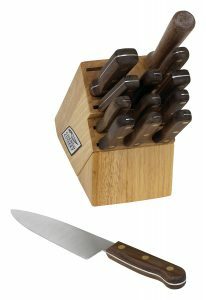 This Chicago Cutlery Walnut Tradition 14 piece block set makes a great gift for newlyweds or a college graduate in his first apartment. The set features a 5-inch utility knife, a 6-inch chef’s knife, an 8-inch sharpening steel, a pair of 3-inch paring knives, 8 steak knives and a storage block made from hardwood. The blades are high-carbon stainless steel, and there is a full tang (the metal running down the length of the knife into the handle) for great durability and balance. This knife set is a bargain, and the excellent performance is something home cooks love. Treat them right, washing them by hand and sharpening them from time to time, and they will last for many years. Knives are something we use every day, no matter whether we are professional chefs or simply enjoy cooking for our family at home. This is why a knife set should be viewed as an investment rather than something to skimp on. A good set of knives is built to last a lifetime. Not only that, but poor quality knives can be dangerous. You might assume that a cheap, blunt knife is safer in the kitchen than a sharp knife, but that is not correct. Trying to force a blunt knife through food means it is more likely to slip and end up in your finger. A high-quality Chicago Cutlery knife will easily slide through whatever you are trying to cut, resulting in neat slices instead of ragged ones, and intact fingers! 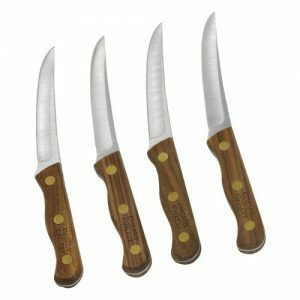 Chicago Cutlery has a reputation for quality, and their entire range of kitchen knives is designed with the professional chef in mind. Knives should be designed to last and perform the tasks they are supposed to. A steak knife, for example, is supposed to cut cleanly and easily through a steak, a serrated bread knife is meant to cut any bread, a chef knife is multi-purpose and can be used to cut meat or fish steaks, and perform other tasks too. A sharpening steel will keep all your blades in tip-top shape. This knife set offers a chef’s knife, a paring knife, and a boning knife. The handles are contoured and ergonomic, and they are made of solid walnut wood. The stainless-steel blades resist stains, and rush and these knives are covered by a lifetime warranty because they are of such high quality. Chicago Cutlery always gets great reviews because these knives are built to last. They also look stylish and elegant. Because of the high level of carbon in the blade, they are durable, and you can get them back to super-sharpness every time you need to sharpen them. These knives are offered for an economical price compared to other top- quality brands, which is something else that buyers always love about Chicago Cutlery. This sharpening steel will sharpen any knife with just a few strokes. It is long enough to handle any knife without being too long to use comfortably. Because it is grooved rather than straight, it will take off tiny bits of metal to sharpen your knife blades. This results in a silvery powder between the grooves, but it is easy enough to clean out. The walnut handle is much more elegant than plastic or polymer, and it gives a good grip. This no-nonsense sharpening steel is a ‘must’ if you have a set of Chicago Cutlery Walnut knives, so you can take the best care of the blades and ensure they are kept sharp and in the best condition for many years. This is not expensive, but it performs like an expensive sharpening steel. This knife is really sharp, and you will find you use it all the time, reaching for it when various knives could be used, just because this one stays sharp for a long time and cuts things quickly. 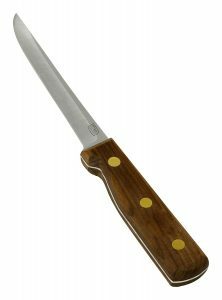 The Chicago Cutlery Walnut Tradition 3 inch slant tip paring knife is well balanced and feels good in the hand. This knife should last twenty or thirty years, and a lot of people have these knives that long or even longer. To keep it in the best condition, never soak the knife or put it in the dishwasher. Use a soapy cloth to wipe the blade clean, then rinse it and dry it. 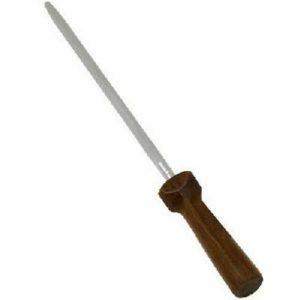 Treated in this way, you can expect a long life from this excellent quality knife. This is a beautiful knife, both regarding appearance and functionality. The Walnut is stylish and classic, and the blade is sharp and performs well. This knife is comfortable to hold regardless of your hand size, and Chicago Cutlery is known for selling professional quality knives at really competitive prices. If you are looking for a paring/boning knife, this one gets consistently high praise and has many loyal fans who prefer it over any other brand including the more expensive ones like Wusthof or Henckels, just because it performs as well or better and also looks gorgeous. This knife comes with a lifetime warranty. Chicago Cutlery is sharp, durable and lightweight. It lasts for years, although it is inexpensive to replace should you ever need to. 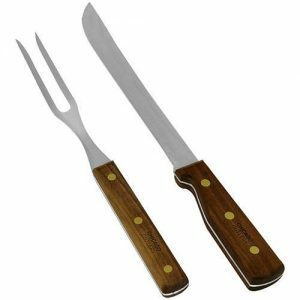 Just like the rest of the Chicago Cutlery Walnut Tradition range, this 2 piece carving knife set gets great reviews, and people love how comfortable and easy it is to use. Wash the knife by hand after use and keep it in a knife block or sleeve, and it should serve you for many years. The high-carbon stainless steel blade means the knife will slide through your meat while the sharp 2-prong fork holds the roast in place. The knife will cut your roast into neat strips instead of giving it the ragged-looking edges that inferior knives often do. This boning/utility knife feels very balanced in hand and offers a great cutting edge. It is inexpensively priced but well designed and very functional in the kitchen. If you are only going to have a few knives, then make sure this is one of them. 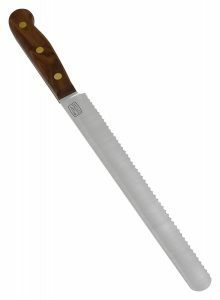 You will need a long, wide chef’s knife for cutting large foods like cantaloupes or pumpkins, as well dicing food finely, and also a serrated bread knife, but this boning/utility knife can be used for pretty much everything else, and you will find you reach for it often when preparing food. Like all Chicago Cutlery Walnut Tradition knives, this one features the stylish walnut handle and high-carbon stainless steel blade which stays sharp for an amazingly long time between being resharpened. 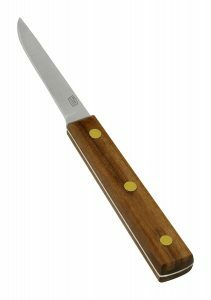 Excellent for carving cooked meats, this 8-inch slicing/carving knife is a great addition to your collection of kitchen knives. One nice feature on this one is the end curves up into a point rather than being straight, and this makes it easier to cut and serve the meat. This knife will last for decades, and it will only need sharpening a few times a year even if you use it frequently. 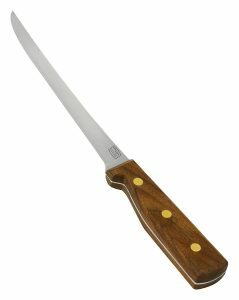 The Chicago Cutlery Walnut Tradition 8 inch carving knife gets plenty of praise and great reviews. It even slices bread better than most bread knives, so you can get away with just having a few knives in your collection if you use them for different things. Saying that Chicago Cutlery is cheap enough to buy a full set and it will last for decades anyway. This slicing/fillet knife is ideal for cutting raw chicken or filleting fish, although the blade is quite rigid which might not be what you are used to if your current slicing knife is quite flexible. The rigidity does seem to offer more control though so that you can cut your meat or fish into nice, even filets or slices. Although this knife is unwieldy for cutting smaller fish such as perch, it is great for cleaning walleyes and other larger species. It is also ideal for making sashimi and sushi when it is important to have smooth, even pieces of fish. The walnut handle is slip-resistant which is always a bonus, and it looks stylish too. Rated ‘just as good as expensive steak knives’ on America’s Test Kitchen, it should not surprise you that these knives get great reviews on Amazon too. If you are used to using serrated steak knives, you might be wondering just how well a non-serrated knife will compare, but these slice through the steak easily no matter what type of steak you are eating or how it has been cooked. You can sharpen them on a regular knife sharpener too. The Walnut handle feels good in the hand and looks classier than polymer. If you care for these properly, washing them by hand instead of in the dishwasher and sharpening them when necessary, there is no reason they will not last for years. This serrated knife has a 10-inch blade, so you will not have a problem cutting an especially large or wide loaf of bread with it. Do make sure your knife block can accommodate a 10-inch blade though. The knife is 15 inches long including the handle. The teeth on this knife are spaced a little wider than on various other bread knives, but this does not impair the cutting in any way. In fact, this knife is good at slicing bread and leaves you will smooth, not ragged, slices. This serrated bread/slicing knife offers an outstanding performance, and it is little wonder this knife keeps getting such excellent reviews. Look after this knife properly, and it should last a lifetime. Some knives have metal handles while others have plastic handles. Wood is also a lovely material for the handle of a knife because it is nice to hold and does not get as cold as metal handles. A handle can be humanmade or natural. Natural materials like bone or abalone can be very beautiful. Abalone comes from the shell of a mollusk, and it is sometimes used to make gentlemen’s pocket knives because it is not as durable as some other materials. Bone is usually given a special texture to improve the grip the user has. Bone is easy to shape, attractive and durable. Mother of pearl is also beautiful. The strongest lightweight synthetic material for a knife handle is carbon fiber. The carbon strands are light-reflecting which makes the weave pattern in carbon fiber very attractive. Because carbon fiber takes a while to make, it is more expensive than some other options. Stainless steel is anti-corrosive and durable, and it is often used along with rubber or plastic, so you have a good grip. Unfortunately, these handles are quite heavy. Titanium is lighter and feels good in the hand. Aluminum is durable, and it feels solid without feeling weighty. The finished aluminum knife handle is usually anodized to add protection and color. You will not see leather-handled knives in many kitchens, but leather is used on some military and hunting knives. They are made by stacking leather washers. They are attractive but not as durable as some other materials. Zytel nylon, which was developed by Du Pont, is a thermoplastic material which is resistant to abrasion and almost unbreakable. A surface texture is often added to Zytel to improve the grip. Nearly any hard material can be used to make a knife handle, although metal seems to be one of the most popular choices with cooks, along with wood, prized for its beauty. Oak, maple, rosewood, or other hardwoods are used to make hunting knife handles, while fine or soft woods such as black walnut are not so good if they are exposed to a lot of water or moisture. If mesquite, desert ironwood, spalted maple or another stabilized wood is impregnated with plastic, it can be used to make a waterproof handle which is both durable and comfortable. Fancy wood-handled knives are prized by collectors, while kitchen knives often feature wooden handles for both durability and a comfortable grip. Wood offers a charming, old-fashioned style, whether you are using a wooden-handled chef’s knife or investing in a set of steak knives. You will also like these posts….